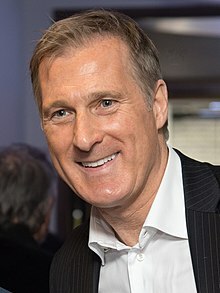 Maxime Bernier PC MP (born January 18, 1963) is a Canadian businessman, lawyer, and politician serving as Member of Parliament for the riding of Beauce since 2006. He is the founder and current leader of the People's Party of Canada. Prior to being elected, Bernier held positions in law, financial and banking fields. After being elected, he served as Minister of Industry, Minister of Foreign Affairs, Minister of State for Small Business and Tourism, which later become the Minister of State for Small Business and Tourism and Agriculture in the cabinet of then-Prime Minister Stephen Harper. Following the Conservatives' defeat in the 2015 election, he served as opposition critic for Innovation, Science and Economic Development in the shadow cabinets of Rona Ambrose and Andrew Scheer, until June 12, 2018. He ran in the 2017 Conservative Party of Canada leadership election, and came in a close second with over 49% of the vote in the 13th round, after leading the eventual winner, Andrew Scheer, in the first 12 rounds. On August 23, 2018, citing disagreements with Scheer's leadership, he resigned from the Conservative Party to create his own party. The party's name, the People's Party of Canada, was announced on September 14, 2018. Bernier was born in Saint-Georges, Quebec, the son of Doris (Rodrigue) and Gilles Bernier, a well known radio host, who represented the riding of Beauce from 1984 to 1997, first as a Progressive Conservative and then as an independent. In a 2010 interview with John Geddes, Bernier said he respects his father as a Mulroney-era politician, but tries not to emulate his style. Bernier has stated that his views were shaped from his upbringing in Beauce to his life experiences. He is the second oldest child and has two sisters, Brigitte and Caroline, and a brother, Gilles Jr. In his teens, Bernier played football as a member of the Condors, the team of the Séminaire St-Georges, that won the Bol d’Or in 1980 at the Olympic Stadium. He obtained a Bachelor of Commerce degree from the Université du Québec à Montréal, completed his law degree at the University of Ottawa and was called to the Quebec Bar in 1990, which he is still a member. For 19 years, Bernier held positions in law, several financial and banking fields, such as working as a lawyer at McCarthy Tétrault, rising up to become branch director at the National Bank, the office of the Securities Commission of Québec as Director of Corporate and International Relations, an adviser (handling fiscal reform) from 1996 to 1998 in the office of Bernard Landry—Quebec's finance minister and Deputy Primer of Quebec at the time—and Standard Life of Canada as the Vice-President of Corporate Affairs and Communication. He also served as Executive Vice-President of the Montreal Economic Institute, a prominent Quebec free-market think tank, where he authored a book on the topic of tax reform. In 2005, Bernier became the Conservative Party candidate for the riding of Beauce for the 2006 federal election. Stephen Harper had asked his father to re-enter politics who advised Harper that Bernier should run instead. He won handily, taking 67% of the popular vote, the largest majority for a Conservative outside of Alberta. His ties to the riding and his support for provincial jurisdictions (which earned him an endorsement from former Social Credit party leader Fabien Roy) were factors in his win. Some political pundits believed Bernier's ideas led to the unexpected Conservative breakthrough in Quebec during the election. Bernier was one of the higher-profile freshman MPs from Quebec, and as such, on February 6, 2006, was appointed Minister of Industry and minister responsible for Statistics Canada, and by virtue of being appointed as the Minister of Industry, he also served as the Registrar General. During his time as Industry Minister, Bernier set in motion steps that led to reformation of the telecommunications industry, particularly on local phone service. Professor Richard J. Schultz from McGill University lauded his attempt to deregulate the telecommunications industry, calling him "the best Industry Minister in 30 years, without challenge." James Cowan from Canadian Business, called Bernier tenure " a golden age", by pointed out that his work on attracting investment was laudable while criticizing anyone who considered Bernier a lightweight. On August 14, 2007, Bernier was appointed as Minister of Foreign Affairs, replacing Peter MacKay, who became the Minister of National Defence. The rumour is that appointment had to do with preventing Bernier from pushing his personal views such as opposing corporate welfare farther as industry minister. During the beginning of his tenure, Bernier's personality and charm received praise among foreign dignitaries. In May 2008, it was revealed that Bernier became involved in an incident in which he inadvertently left a briefing book at the home of his girlfriend at the time, Julie Couillard. Although these types of incidents were not unique, he was expected to be demoted, but accepted responsibility and offered to resign his cabinet post on May 26, 2008. Prime Minister Stephen Harper, who initially dismissed the relationship as irrelevant, accepted his resignation. Bernier explained that the incident made him rethink his political career and that he would avoid taking government information out of his parliamentary office in future. Recalling his tenure as Minister of Foreign Affairs, Bernier felt unsatisfied due to the Prime Minister's Office controlling the portfolio, making it harder for him to implement his views into Canadian foreign policy. Six days before the 2008 election, Couillard released a book which was supposed to reveal his confidential opinions such as his personal objection to the Iraq War. The English version peaked at No. 6 on La Presse's bestseller list while the French version reached No. 5. However, the book was viewed negatively by Bernier's constituents. He was reelected with 62% of votes. In 2009, Bernier decided to start a blog and spent the next four years travelling across the country talking and debating about the issues that mattered to him. Bernier's speeches were criticized by Jean Pierre Blackburn, Raymond Blanchard and Tom Mulcair, but praised by Andrew Coyne, Warren Kinsella, and André Pratte. Recalling his time as a backbencher, Bernier stated, "I had invitations across the country [...], people got to know me. They saw that I had good ideas, that I wasn't an idiot". He was also chair for the National Defense Select Committee. On September 8, 2010, Bernier's Quebec colleagues pushed for the federal government to invest $175 million in the Videotron Centre in Quebec City and wore vintage Nordiques jerseys to express support in a photo-op however, Bernier was noticeably absent from this group. A few days later on a radio interview, he criticized the feasibility study by Ernst & Young to express opposition to the investment by stating that makes little financial sense. The government later decided against the investment. When recalling about that decision, he revealed that his colleagues were furious at him because they wanted to use the investment to "Buy votes". It had been rumoured that Conservative Party insiders wanted Bernier to take over as leader of the ADQ if Stephen Harper's preferred choice, Mario Dumont, became Quebec lieutenant. There were rumours that Bernier was considering a leadership run and in 2009, there was a movement to draft Bernier for the leadership of the ADQ. However, Bernier later stated, "I'm flattered that some people can see me as ADQ leader, but it doesn't interest me at all". On May 18, 2011, Bernier was appointed as Minister of State (Small Business and Tourism). It was rumoured that Bernier's appointment had more to do with speeches where members of the cabinet felt that they were critical of policies that his government were pursuing. However, Bernier stated that he accepted the role because he felt he did not accomplish enough in his career and expressed a desire to end the budget deficit. His responsibilities were expanded with his appointment on July 15, 2013, as Minister of State (Small Business, Tourism, and Agriculture). During this time, he led the Red Tape Reduction Commission, which created a rule that for every regulation added another one has to be cut. After Jim Flaherty announced his retirement as Minister of Finance,Cowen considered him a candidate for the job. In the 2015 federal election he released a viral retro campaign jingle, which had support from his constituents. On November 20, 2015, Bernier was appointed by interim Conservative Leader Rona Ambrose as Critic for Economic Development and Innovation. He resigned on April 7, 2016 in order to run in the Conservative Party's leadership election. On March 6, 2016, Bernier introduced a motion that would have required Bombardier executives to explain the reasoning for the federal government to bail them out. However, the governing Liberal Party of Canada blocked it. Bernier argued that instead of Bombardier asking for funding, they should perform a corporate restructuring. Press Progress released a video of Bernier stating, in a conservative conference, that China has "less government and more freedom" than Canada. Bernier argued Press Progress misconstrued his comments, stating, "Left-wing publication belonging to the Broadbent Institute bizarrely claims I admire Chinese dictatorship. They totally distort what I said in speech in Barrie two weeks ago where I spoke about fairness and small [government]. I was not talking about political but economic freedom. Liberalising economy is reason why they went from dirt poor to second largest eco in world. Did Broadbent activists miss that I joked however we used to have same freedom here before Libs were elected. People in the room laughed. Broadbent people didn’t get it?" On April 7, 2016, Bernier filed his nomination to be a candidate in the 2017 Conservative Party of Canada leadership election. Bernier mentioned that he had no expectation of running, but he met people who encouraged him, consulted with his family and ran to share his views and ideas around four principles of freedom, responsibility, fairness, and respect  Nathan Giede wrote that Bernier was "the living reincarnation of all Laurier's good ideas and Deif the Chief's pan-Canadian optimism". In the Times Colonist, Bernier stated, "They can call me a fiscal conservative, they can call me a conservative who believes in freedom, they can call me reasonable libertarian, call me anything you want—call me Max, call me Maxime, call me 'Mad Max'." Occasionally, he displayed a sense of humor which helped him gain voters' attention. The support that Bernier received during the race shocked him and political pundits. On May 27, 2017, he finished a close second in the final round of voting to Andrew Scheer. William Watson argued that although some of Bernier's policies,were reflective of the role "rugged individualism" played in Canada's past, may have played a role in his loss, they could also affect Canada's future. A few days after the results, Michael Chong, another leadership candidate, argued that both his and Bernier's campaigns represented "real change, significant change" to the party but felt they wanted the status quo. Former Chief of Staff to Brian Mulroney, Stanley Hartt who found Scheer's victory not "stirring" suggested that Scheer should have taken ideas from Bernier platform; which Hartt stated was "based on rock-solid economics" and found it politically implementable. Bernier later told The Globe and Mail that he believes "It was the first time that somebody did a campaign based on principles without doing any compromise with special interest groups, without trying to buy votes". Bernier revealed that he received job offers from the financial sector in Toronto but decided to stay after taking a vacation with his family, by stating "Many people are still cynical about politicians. I always wanted to do politics differently and remain honest with my convictions"
On August 31, 2017, Bernier was reappointed critic for Innovation, Science and Economic Development Canada by Andrew Scheer. After it was revealed that the 2015 Conservative campaign team knew about sexual assault allegations against former Conservative MP Rick Dykstra, on January 31, 2018, Bernier publicly demanded answers as he was heading towards a caucus meeting into the handling of the nomination as did Conservative MP Brad Trost, who tweeted in favor of Bernier statement. After the meetings, Scheer reversed his previous decision. In February 2018, Bernier introduced a private member bill, Bill C-396, An Act to amend the Department of Industry Act (financial assistance) to ensured transparency for government handouts to business. was defeated by the Liberal Party. Bernier intended to publish a book, Doing Politics Differently: My Vision for Canada. In April 2018 he prereleased a chapter on his publisher website explaining why he made ending supply management an issue during the leadership campaign. The chapter referred to Quebec's dairy farmer lobby, which opposed his views on supply management and supported Scheer's candidacy, as "fake Conservatives" because they left the party after Scheer victory and expressed disapoinment but compare supply management to the fate of the Berlin Wall in an interview with La Presse. However, his Conservatives colleagues who saw the chapter as an attack on the legitimacy of Scheer's victory in the leadership election, Bernier agreed to postpone publication of the book indefinitely for the sake of "party unity". He asserted that his book was not about his leadership campaign but was intended to discuss ideas that mattered to him. He later told the Toronto Star in an email that he defended his comments and that "the book will be published one day and you have to be patient". On June 12, 2018, Scheer announced Bernier had been dismissed from the shadow cabinet after he allegedly violated his pledge of publishing the book by posting the chapter on his website on June 5, after it had been removed by from the publisher's website. Bernier denied that he broke the pledge by stating "there is nothing new, I did not 'publish' it". During a At Issue panel, Chantal Hebert was critical of Bernier decision, Coyne found Bernier to be a victim of a political setup and Paul Wells thought Scheer was being paranoid. On June 15, Bernier stated in an interview that he believed his stance on supply management not his decision to post the chapter was the real reason behind his dismissal. On August 23, 2018, he announced that he was leaving the Conservative party with the intention of founding a new pan-Canadian political party. Bernier held a press conference where he declared that the Conservative Party was "too intellectually and morally corrupt to be reformed", tries to avoid important but controversial issues of concern to Canadians, and was afraid to articulate any coherent philosophy to support its positions. He later told Vassy Kapelos that his party will debate discussions that "the leadership and the caucus" did not want to have when he was a party member. Bernier was criticized by Former Conservative Prime Minister Stephen Harper and Brian Mulroney while being defended by John Robson, who found Harper statement hypocrtitical, Levy and Christine Blatchford. In a National Post op-ed, Bernier stating that his real motive is to reverse what he believe is the "public choice dynamic" in the Canadian political system that leads to vote-buying and pandering by the main political parties. Bernier reiterated his belief that the Conservative Party cannot be reformed to end this practice and that a new political party is required. On September 14, 2018, Bernier announced the creation of the People's Party of Canada. He stated that his party is "a coalition of people who are disenchanted with traditional politicians who say one thing one day and the other the next". It plans to advocate for "smart populism" which Bernier defines as policies that are based on principles of freedom, responsibility, fairness, and respect, that speak for "all Canadians" and which do not appease special interest groups. When asked about organizing his party, Bernier mentioned that he will use tools that did not exist in the past, such as the use of social media. Bernier is the father of two teenage daughters. Since 2010, he has been in a long-term relationship with Catherine Letarte, a National Ballet School-trained ballerina, who worked for a women's shelter and currently runs a health community centre. Bernier has a history of quoting James M. Buchanan, Friedrich Hayek, and Henry Hazlitt and been known as "Mad Max", the "Bloc-buster", or the "Albertan from Quebec" by his Ottawa colleagues. On September 29, 2013, he trained for and ran an ultramarathon for thirteen hours across his riding, while raising $153,000 for a local food bank, Beauce Harvest Foundation. In 2014, Bernier participated in the Rodeo de Cochons after being challenged by a local mayor. In 2016, after the Conservative Party decided to remove the traditional definition of marriage from their constitution, Bernier marched in Toronto Pride Parade. Doing Politics Differently: My Vision for Canada – Chapter 5 "Live or die with supply management"
^ Office became known as "Minister of State (Small Business and Tourism, and Agriculture" from 2013 to 2015. ^ Maxime Bernier (August 23, 2018). "Why I Am Leaving the Conservative Party of Canada". maximebernier.com. ^ a b c Delmar, Dan (February 14, 2017). "Dan Delmar: Maverick Maxime Bernier unites parts of Quebec and of the West". Montreal Gazette. Retrieved February 16, 2017. ^ "The Canadian Parliamentary Guide". P. G. Normandin. January 1, 1996. Retrieved October 31, 2016 – via Google Books. ^ "Genealogy Doris Rodrigue". Retrieved October 31, 2016. ^ a b "How do they get away with it?". Macleans.ca. December 10, 2010. Retrieved April 27, 2017. ^ a b Taber, Jane (September 10, 2010). "Maxime Bernier breaks ranks on arena funding". Globe and Mail. Retrieved October 8, 2012. ^ a b "Biographie « Le blogue de Maxime Bernier [Biography « Maxime Bernier's blog]". Maxime Bernier. Archived from the original on February 3, 2013. Retrieved October 8, 2012. ^ a b c "Maxime Bernier". IEDM. Retrieved 2017-12-30. ^ "Conversations from the Frontier" (PDF). May 19, 2010. Retrieved May 5, 2018. ^ a b c "L'Albertain du Québec" [The Albertan of Quebec]. Archived from the original on June 2, 2017. ^ "History of Federal Ridings since 1867". Retrieved 18 December 2017. ^ "Maxime Bernier: Quebec needs to embrace Canada". National Post. May 20, 2014. Retrieved April 27, 2017. ^ "More Quebec MPs named to cabinet than expected". Canadian Broadcasting Corporation. February 6, 2006. Retrieved April 15, 2014. ^ "CRTC gives thumbs-up to telecom complaints agency". Canadian Broadcasting Corporation. December 22, 2006. Retrieved October 8, 2012. ^ "Conservatives overrule CRTC on regulation of internet phones". Canadian Broadcasting Corporation. November 15, 2006. Retrieved October 8, 2012. ^ "Ottawa accelerates deregulation of local phone service". Canadian Broadcasting Corporation. December 11, 2006. Retrieved October 8, 2012. ^ "Just wondering ... about Bernier". Globe and Mail. May 28, 2008. Retrieved December 27, 2016. ^ "Professor Schultz's take on my telecom reform". Maxime Bernier — English. Retrieved 2018-06-15. ^ "A Conservative war on business". Canadian Business - Your Source For Business News. 2013-10-24. Retrieved 2017-11-17. ^ "Why James Moore is the right choice for Industry Minister". Canadian Business - Your Source For Business News. 2013-07-15. Retrieved 2017-11-17. ^ "Opposition leaders slam Harper's cabinet shuffle". CTV News. August 15, 2007. Retrieved October 8, 2012. ^ "Quebecers gain key cabinet roles". Montreal Gazette. August 14, 2007. Archived from the original on April 10, 2013. Retrieved October 8, 2012. "Maxime Bernier resigns as foreign affairs minister". CTV. Retrieved May 30, 2008. ^ Castonguay, Alec. "La métamorphose de Maxime Bernier". L’actualité (in French). Retrieved 2018-06-15. ^ "John Ivison: Maxime Bernier says Conservative leadership race is down to himself and Kevin O'Leary". ^ a b c d "Who's Maxime Bernier? From Separatist And Scandal To Tory Leadership Front-Runner (Part 1)". Huffington Post. May 19, 2017. Retrieved May 24, 2017. ^ "Sovereignists signalling desperation - Toronto Star". ^ "When government information goes astray". CBC News. Retrieved 2017-11-15. ^ "BTC: Monday morning smile - Macleans.ca". Macleans.ca. 2008-05-19. Retrieved 2017-11-30. ^ a b "Huh. That was actually unexpected.. - Macleans.ca". Macleans.ca. 2008-05-26. Retrieved 2017-11-30. ^ a b c Strombo (February 3, 2012). "FULL INTERVIEW: Maxime Bernier". Retrieved October 31, 2016 – via YouTube. ^ "Harper shrugs off new concerns about minister's ex-flame". Canadian Broadcasting Corporation. May 26, 2008. Retrieved March 9, 2013. ^ "They do things differently in the Beauce: Liveblogging MaxBernierStock". Macleans.ca. June 25, 2008. Retrieved April 27, 2017. ^ "The Shotgun: Maxime Bernier agrees with Harper: "Iraq war was a mistake"". westernstandard.blogs.com. Retrieved 2019-01-07. ^ "Omny.fm". web.archive.org. 2017-10-04. Retrieved 2019-01-07. ^ "Julie ou Maxime, la Beauce a choisi | Isabelle Hachey | Élections fédérales". La Presse (in French). 2008-10-10. Retrieved 2018-01-15. ^ a b "How 'Mad Max' Bernier went from comic relief to Tory front-runner - Macleans.ca". Macleans.ca. 2017-04-06. Retrieved 2017-10-31. ^ "Maxime Bernier wants to have an adult conversation". Globe and Mail. October 17, 2010. Retrieved October 8, 2012. ^ "Magical Maxime - Macleans.ca". Macleans.ca. 2011-02-09. Retrieved 2017-11-18. ^ a b "Bernier bashing | André Pratte | André Pratte". La Presse (in French). 2010-04-22. Retrieved 2017-11-18. ^ "Spoken like a true Conservative - Macleans.ca". Macleans.ca. 2010-04-26. Retrieved 2017-11-18. ^ "Speaking for Canada". warrenkinsella.com. Retrieved 2017-11-18. ^ "From fringes to front runner, Maxime Bernier's long road to redemption". Retrieved 2017-11-18. ^ "Profile - Bernier, Maxime". lop.parl.ca. Retrieved 2018-01-15. ^ "Bernier condemns proposed federal funding of Quebec arena". Retrieved 2018-09-09. ^ Ouellet, By Martin (2011-03-16). "Harper strongly defends decision not to fund Quebec City arena". Montreal. Retrieved 2018-09-09. ^ "Maxime Bernier: Why my new political movement? Because Canada has been hijacked". National Post. 2018-08-31. Retrieved 2018-09-09. ^ Castonguay, Alec. "La métamorphose de Maxime Bernier". L’actualité (in French). Retrieved 2018-09-09. ^ "L'alliance Dumont-Harper | L'aut'journal". lautjournal.info (in French). Retrieved 2017-11-15. ^ "Keith Beardsley: Maxime Bernier's latest Quebec gambit". National Post. 2010-04-20. Retrieved 2017-11-15. ^ "ADQ members hope to woo Maxime Bernier". CTVNews. 2009-02-09. Retrieved 2017-10-25. ^ a b "BERNIER, The Hon. Maxime, P.C., B.Comm., LL.B." Parliament of Canada. ^ "Video: Feds to cut red tape for small business". ^ "Five Conservative ministers ready to take Jim Flaherty's place". Canadian Business - Your Source For Business News. 2014-03-18. Retrieved 2017-11-15. ^ Montreal Gazette. "Maxime Bernier gets politically groovy with new radio jingle". ^ "Maxime Bernier's Radio Jingle Will Haunt Your Dreams". HuffPost Canada. 2015-09-14. Retrieved 2018-09-21. ^ "Guest Maxime Bernier & Jesse Brown talking Postmedia Layoffs (Bonus Alan Cross!)". ^ a b "Quebec MP Maxime Bernier officially enters Conservative leadership race - Toronto Star". Retrieved October 31, 2016. ^ CTV News. "Liberals vote down Tory move to force Bombardier execs to testify at committee". ^ "The Mark Steyn Show with Maxime Bernier - YouTube". ^ "Maxime Bernier: China has "less government and more freedom" than Canada". March 29, 2016. ^ "Maxime Bernier's China comments continue to confuse". April 5, 2016. Retrieved February 25, 2017. ^ "Maxime Bernier begins marathon race for Conservative leadership". Retrieved 2018-09-21. ^ "Conservative MP Maxime Bernier discusses ways party can regain public trust - Watch News Videos Online". ^ "CPC Interview Series: Maxime Bernier". The Canadian-Muslim Vote. Retrieved 2018-05-05. ^ Giede, Nathan. "I'll take the Bernier". Prince George Citizen. Retrieved 2019-01-07. ^ Turcotte, Marc-Antoine. "Quand Maxime Bernier fait dans l'humour". Le Journal de Montréal (in French). Retrieved 2018-01-15. ^ "Foes mock 'Mad Max' Bernier over photoshopped Tory leadership ad: 'If people laugh — even better'". National Post. 2016-10-05. Retrieved 2018-01-15. ^ "News Special: Conservative Leadership Convention 2017". CBC Television. May 27, 2017. ^ "William Watson: Maxime Bernier scored a big victory, even if he narrowly lost the Conservative race". Financial Post. 2017-05-29. Retrieved 2017-12-03. ^ "Michael Chong back on the farm 1 month after Conservative leadership loss". CBC News. Retrieved 2017-10-25. ^ "New Conservative leader should be open to new ideas: Stanley Hartt for Inside Policy | Macdonald-Laurier Institute". www.macdonaldlaurier.ca. Retrieved 2018-03-24. ^ "Maxime Bernier eyes finance critic job, hints at future Conservative leadership run". Retrieved 2018-09-10. ^ "A closer look at Andrew Scheer's team of shadows: Aaron Wherry". CBC News. Retrieved 2017-11-17. ^ "Quebec MP Maxime Bernier demands answers from Tories on Rick Dykstra affair". CTVNews. 2018-01-31. Retrieved 2018-06-19. ^ "Corporate Welfare and Backdoor Deals". Maxime Bernier — English. Retrieved 2018-09-10. ^ "Are the Liberals Hiding Something?". Maxime Bernier — English. Retrieved 2018-09-10. ^ "My chapter on supply management". Maxime Bernier — English. Retrieved 2018-06-14. ^ "Maxime Bernier publiera un livre cet automne - Beauce Média". Beauce Média (in French). 2018-01-10. Retrieved 2018-01-15. ^ "Andrew Coyne: Tories cry foul as Maxime Bernier spills the beans, er, milk on leadership race". National Post. 2018-04-12. Retrieved 2018-06-14. ^ "Bernier prédit la fin de la gestion de l'offre - La Presse+". La Presse+ (in French). 2018-04-10. Retrieved 2018-09-03. ^ "Bernier pulls book that accuses Scheer of using 'fake Conservatives' to win leadership | CBC News". CBC. Retrieved 2018-06-14. ^ "Bernier stands by comments that Scheer won the Tory leadership thanks to 'fake Conservatives' | The Star". thestar.com. Retrieved 2018-06-14. ^ "Bernier's lack of loyalty, not supply management, behind demotion: Scheer". CTVNews. 2018-06-13. Retrieved 2018-06-14. ^ "Maxime Bernier attribue son expulsion du cabinet fantôme à sa position sur la gestion de l'offre - L'Éclaireur Progrès". L'Éclaireur Progrès (in French). 2018-06-18. Retrieved 2018-06-19. ^ "Maxime Bernier slams Justin Trudeau's 'cult of diversity' in Twitter rant". Global News. Canadian Press. August 13, 2018. Retrieved August 17, 2018. ^ "John Ivison: Justin Trudeau blows dog-whistle on Conservative xenophobia". Calgary Herald. 2018-08-21. Retrieved 2018-09-27. ^ Bock-Côté, Mathieu. "Maxime Bernier au pays des fous". Le Journal de Montréal (in French). Retrieved 2018-09-27. ^ "Lise Ravary: It's not racist to question multiculturalism in Canada". Montreal Gazette. 2018-08-20. Retrieved 2018-09-27. ^ "Maxime Bernier is challenging orthodoxy. He deserves a civil reply: Opinion | CBC News". CBC. Retrieved 2018-09-27. ^ "Mad Max is proving he's a political force | The Star". thestar.com. Retrieved 2018-12-14. ^ "Les planètes pourraient s'aligner pour Bernier". La Presse+ (in French). 2018-11-11. Retrieved 2018-12-14. ^ "People's Party under Bernier to champion more privatized healthcare, unity over diversity". CTVNews. 2018-09-16. Retrieved 2018-09-20. ^ "Maxime Bernier quits the Conservative Party — and wants to start his own". Global News. August 23, 2018. Retrieved August 23, 2018. ^ "Read the full text of Maxime Bernier's speech: 'Scheer keeps talking about his positive Conservative vision. But nobody knows what that is'". National Post. 2018-08-23. Retrieved 2018-08-24. ^ "Bernier didn't tell anyone from the Conservative Party about his dramatic exit | CBC News". CBC. Retrieved 2018-10-29. ^ Johnson, Kelsey (2018-09-11). "Bernier's departure from Tories will make it harder to beat Trudeau: former PM". iPolitics. Retrieved 2019-01-07. ^ Robson, John (2018-08-28). "Why should Maxime Bernier wait? Haven't we all waited long enough? | National Post". Retrieved 2019-01-07. ^ Comment, Full (2018-08-24). "Christie Blatchford: I like Bernier, who has the courage to go his own way | National Post". Retrieved 2019-01-07. ^ "Maxime Bernier: Why my new political movement? Because Canada has been hijacked". National Post. 2018-08-31. Retrieved 2018-09-10. ^ "Maxime Bernier lance le Parti populaire du Canada | JOËL-DENIS BELLAVANCE | Politique canadienne". La Presse (in French). 2018-09-14. Retrieved 2018-10-29. ^ "In training with Maxime Bernier". Maclean's. May 14, 2013. ^ "Who's Maxime Bernier? From Separatist And Scandal To Tory Leadership Front-Runner (Part 3)". HuffPost Canada. 2017-05-19. Retrieved 2018-06-15. ^ "Christie Blatchford: How much do I love Max Bernier? Let me count the cartels". National Post. 2018-08-29. Retrieved 2018-09-09. ^ Ivison, John (31 May 2016). "Tory leadership candidate Maxime Bernier no longer a political 'lightweight'". National Post. Retrieved 2018-06-15. In 2007, Bernier was a rising star in Stephen Harper’s cabinet — nicknamed “Bloc-buster” for his sharp attacks on Quebec separatists. ^ "The Future: Maxime Bernier". The Politic. 2007-08-31. Retrieved 2018-09-09. ^ "L'Albertain du Québec - Vigile.Québec". 2017-06-02. Archived from the original on 2017-06-02. Retrieved 2018-06-15. ^ "Maxime Bernier's latest challenge: an ultramarathon". CBC. September 29, 2013. ^ McGregor, Janyce. "Lazy days of summer? Not for these MPs | CBC News". CBC. Retrieved 2019-01-07. ^ "La vérité sur les cochons". La Presse+ (in French). 2014-07-30. Retrieved 2019-01-07. ^ Tasker, John Paul. "'Turning the page': Tory leadership contenders to march in Pride parade | CBC News". CBC. Retrieved 2019-01-07. ^ "Voter Information Service - Who are the candidates in my electoral district?". Retrieved October 31, 2016. ^ "Elections Canada On-line - Élection Canada en-ligne". Archived from the original on March 4, 2016. Retrieved October 31, 2016. ^ "OVR / ROS". Retrieved October 31, 2016. ^ "Financial Reports: Candidate's Electoral Campaign Return". Retrieved October 31, 2016. Wikimedia Commons has media related to Maxime Bernier.